PYRACANTHA, ORANGE GLOW (Orange Firethorn). Hedging Plants, Trees, Shrubs and Conifers. 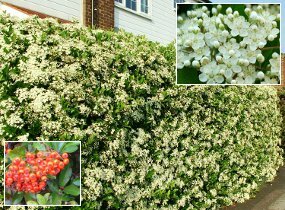 Dense, spiny, fast growing evergreen hedge with clusters of white flowers in June and masses of bunches of spherical, very colourful berries in autumn and winter. These can be useful food for birds. Excellent form with dark green foliage and freely produced orange-red berries. Shade tolerant. Also excellent for training on a wall of any aspect where a height of 9ft (2.7m) and spread of 12ft (3.7m) can be attained, or for a free standing shrub. HEDGE Trim between May and July. For hedges 4-9ft (1.2-2.7m). Plant 2ft (60cm) apart. 30-45cm £2.79 £2.59 £2.40 £2.07 Limited stock available.